Our Felicity Tile Stencil is a great choice for a trendy tile makeover! Based on a classic French tile design, this tile stencil is perfect for painting a gorgeous kitchen tile backsplash, stenciled staircase, table top or painted tile floor. With our tile stencils, you can create a dramatic tile floor on a budget and save big on bath or kitchen renovation! 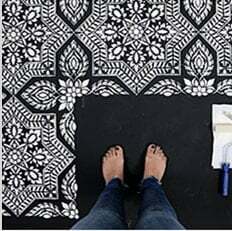 Learn How to stencil a tile – it’s easy even for beginners!